Situated as it is on the eastern coast of the Mediterranean Sea between the land masses of Turkey and Russia to the north, the stretches of Arabia, Iraq and Iran (ancient Assyria and Persia) to the east, and Egypt and Africa to the south, historically Israel was a corridor linking them all. Trade routes ran through the land serving travelers in every direction. Three of the main routes were the Coastal Highway, which ran through the Jezreel Valley and the plains of lower Galilee, the King’s Highway that provided a route to desert caravans to the east of the Jordan river, and the Damascus Road leading to Babylon and Persia. These highways provided convenient access to invading armies and were often scenes of military conflict. Due to its strategic geographic importance, many strong nations battled over this little corridor of land. The Assyrians invaded and occupied Israel from 740 BC and repopulated the region of Samaria with foreigners from Mesopotamia, who became known as the Samaritans. The Babylonians again invaded to quell insurrection and destroyed Jerusalem and the First Temple in 604 BC. The Jewish population was exiled to Babylon, leaving only the poorest families behind in Israel. Persia subsequently took over the whole area and the Babylonian exile lasted almost 300 years until the Persian Empire fell to the Greek leader Alexander the Great in 332 BC. During the time of Darius’ rule, many Jews were allowed to return to Jerusalem, led by Ezra, Nehemiah and Zerubavel, in order to rebuild the Temple. The large number who chose to remain in Babylon, including the now aged prophet Daniel, became a flourishing and influential community. In Israel, the imported Greek culture slowly took hold in the form of Hellenism. It dominated commerce and trade in the area, as well as the newly introduced sporting and cultural events, and in order to participate the Jews had to speak Greek. Many Jews forsook the ways of their God, became assimilated into the culture and adopted the popular Hellenistic lifestyle. 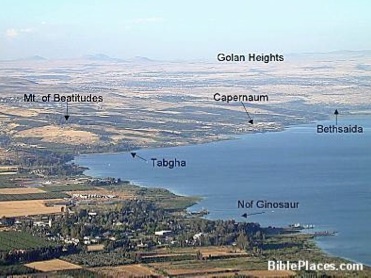 During the three years of his ministry, 27-30 AD, Yeshua was based in the town of Capernaum (Kfar Nachum – Village of Comfort) on the shore of the Kinneret (Sea of Galilee), which was home to Peter and Andrew. Yeshua and his disciples traversed the Galilee, Judea and Samaria. His only trip outside Israel, when he “withdrew,” possibly to have a break from active ministry, was north to the non-Jewish cities of Tyre and Sidon. The highlight of the trip was his encounter with the Canaanite woman (Matthew 15:27). The dynamic center of his ministry, however, was Jerusalem, the site of His Father’s House, the splendid Second Temple. He wept over Jerusalem as he foresaw the destruction that would come upon her before she would be raised up again as the City of Peace – the City of the Great King. His holy city! At Yeshua’s crucifixion at the hands of the Romans, the messianic hopes of many were dashed. Then he arose! And, after his resurrection from the dead until his ascension to the Father, he met with his disciples confirming that he was indeed Messiah and Lord. This was followed by the outpouring of the Holy Spirit at the Temple at Shavuot (Pentecost) after which the Good News of the Kingdom of God indeed went forth, as foretold by the prophet Isaiah, from Jerusalem to the ends of the earth. Undergirding the Word was the promise of YHWH: “I will return to Zion and will dwell in the midst of Jerusalem, and Jerusalem shall be called the faithful city and the mountain of the Lord of Hosts, the Holy Mountain” (Zechariah 8:3). The Word went forth but forty years later, in the year 70, Jerusalem and the Temple were destroyed by the Romans. Again, the majority of the Jews were exiled and the land slowly became desolate until 1948 when, in a marvelous intervention and outworking of God, the modern State of Israel was born. During that interim period of almost 2000 years the land, then named Palestina by the Romans, was invaded and trodden down by Byzantines, Arabs, Kurds, Mongols, Mamalukes, Tartars and Turks – as well as by the Crusaders from the West. Throughout the string of invasions Jews continued to dwell in the land. At the time of the first Crusade, for example, there existed sizeable agricultural Jewish populations in the Galilee. There also were important Jewish communities in Jerusalem and other cities such as Hebron, Akko, Haifa, Jaffa, Ramlah, Ashkelon and Gaza. Merciful Father, deal kindly with Zion, rebuild the walls of Jerusalem. Truly in Thee alone we trust; high and exalted King and God, eternal God. Would that I have wings that I could wend my way to thee, O Jerusalem, from afar! I will make my own broken heart find its way amidst your broken ruins. I will fall upon my face to the ground, for I take much delight in your stones and show favor to your very dust. The air of your land is the very life of our soul. The major political turning point occurred on November 2, 1917, when the British government issued the Balfour Declaration, which stated that: “His Majesty’ s Government view with favour the establishment in Palestine of a national home for the Jewish people.” As a result Great Britain was given the Mandate over Palestine by the League of Nations (the forerunner of the United Nations) in 1922 in which they were charged “…to secure the cooperation of all Jews who are willing to assist in the establishment of a Jewish National Home” in Palestine (Article 4). The Arab state was named Transjordan and the Jewish state, Israel. 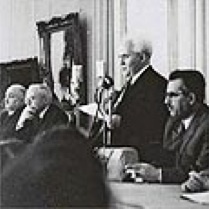 David Ben Gurion was placed at the head of the provisional government which, on May 14th, 1948, proclaimed the establishment of the reborn state of Israel. The fact that we who are now living are witnesses to the miracle of the restoration of the Promised Land to God’s people carries with it a wonder and a responsibility – a “creative challenge…demanding new action, new thinking.”  The full depths of the spiritual meaning and implications may escape us, as it did the early pioneers who might not fully have imagined how their backbreaking work of removing the stones, draining the swamps and suffering malaria would impact the generations to come. To be involved with the life of Israel is to be in labor. What is the meaning of the State of Israel? Its sheer being is the message. [It] is a rehearsal, a test, a challenge to all of us. …Nonparticipation in the drama, is a source of embarrassment. 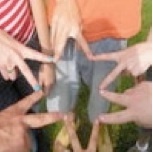 Israel…is a call to every one of us as an individual, a call which one cannot answer vicariously. The murderous threats against this small nation, that has miraculously remained standing through the continuous attacks on every front by the enemy since its inception, are as virulent and relentless as ever. They have, in fact, escalated and become even more blatant and outspoken. Anti-Semitism has morphed into Anti-Zionism, an attack against both Christians and Jews who believe in the Bible’s authenticity as the eternal Word of God and in its proclamations regarding the Land of Promise. 5. Pastor David N. Decker, Revival from Zion!, M.A.D.P.-Tarshish Ltd., Jerusalem, Israel, 2004, 29-32. This entry was posted in Yom Ha'Atzmaut - Independence Day by Cindy Lou. Bookmark the permalink.